With this new year comes a brand new issue of Celebrating Everyday Life with Jennifer Carroll. I think you’re going to really love this January/February issue and not just because you’ll get to see how to make my Sweetheart, Pearl-Encrusted Cookies which grace the cover. This digital issue is filled to the brim with beautiful projects, home decor ideas, delicious recipes a visual trip “across the pond” and so much more. Throughout this post allow me to share a little peek inside the stunning pages of this latest issue. These butterflies may look like they’re poised to fly right off the page but trust me, you won’t need a butterfly net to catch them. You don’t have to be an entomologist to fall in love with these delightful Specimen Cookies. Yes, they’re cookies. I think these would be fun to make and equally exciting to serve to butterfly-loving guests. I’m a Downton Abbey fan and if you are too, you’ll especially enjoy this timely tour of Chatsworth Manor in England. Editor, Jennifer Carroll had a chance to travel across the pond recently to visit this estate and her gorgeous photos of the grounds, stately rooms and elegant halls will put you right in the middle of all of the English grandeur. I’ve been a longtime fan of Susan Branch who is well known for her charming and whimsical illustrations of life, gardening and friendships. You’ll love this interview with Ms. Branch who discusses her latest travels and book while also sharing more of her distinct hand lettering and colorful drawings. One of the things I love about this magazine is that there are always projects and ideas from contributors that feel fresh and new. I always see things I want to try myself like this Winter Tea Bar. It may still be a bit chilly outside but this article on sowing seedlings definitely put me in the mood for gardening. It’s not too early to start thinking about what you’ll be planting this year and Winter Sowing will help you get your seedlings ready for the season ahead. I could go on and on about this lovely issue but why don’t you listen to what Editor, Jennifer Carroll has to say about her first issue of the new year. 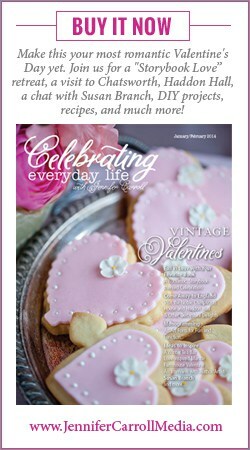 To order the January/February issue of Celebrating Everyday Life (and for digital subscription and back issue information) head over to Jennifer Carroll Media HERE. I love Susan Branch too, and just found her book on her English trip this past week. Another great post Lisa! This looks like a lovely magazine. Congrats on being on the cover. Looking forward to the cinnamon buns recipe next Monday. Happy New Year to you.